New academic year, new innovations and ideas: High at the top of the list ranks the Saluki Innovation Series (SIS) that marked its inaugural debut on September 2 with a fall kick off meeting at the Dunn-Richmond Economic Development Center. The attendees participated in engaging activities that were intended to encourage everyone to imagine, innovate and inspire while listening to some valuable insights and words of wisdom from SIU alumnus and founder of Dippin’ Dots Curt Jones. For anyone who ever dreamed of pursuing the same road of becoming an entrepreneur and innovator, this is your chance. All you have to do is attend the events which are free, open to all undergraduate and graduate students of all majors and offered all-year around. One of the main highlights of the SIS calendar was the Elevator Pitch Competition on Wednesday, September 30. Within 90 seconds, students were given the opportunity to present their business idea to a panel of industry experts. This year’s most persuading pitch came from Lauren Pearce, an accounting junior from Taylorville, Illinois. Calling it the “The Giving Tree,” Pearce’s business idea is to launch a non-profit community garden with goals to sustainably feed and empower low-income and homeless people. As the winner of the SIS elevator pitch competition, she will be representing the SIU College of Business this November at the National Elevator Pitch Competition hosted by the Collegiate Entrepreneur Organization. Equally insightful was the “Discovering your customers” workshop on October 7 presented by Tom Harness, president and owner of Harness Digital Marketing. The workshop provided interested students with effective tools and knowledge to evaluate products, identify markets, and most importantly build relationships with customers. Up next is the “Marketing your product” event featuring Cheryl Burke Jarvis. The SIU College of Business associate dean and professor of marketing will be leading this workshop in which participants will learn how to develop a marketing strategy through hands-on activities and engaging discussions. The workshop is scheduled for Wednesday, November 4, at 6 p.m. at the Atrium of the Dunn-Richmond Economic Development Center. 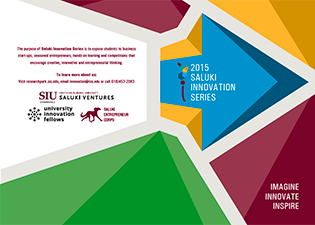 Encouraged by the great turnout at the first-ever SIU Design Thinking Crash Course at the end of spring semester 2015, the campus-registered student organizations Saluki Ventures, Saluki Entrepreneur Corps, and SIU University Innovation Fellows joined forces to launch the SIS prior to the start of the 2015 fall semester. “We know that students want to be leaders, innovators and entrepreneurs, but do not know where to begin. SIU has fantastic resources at the Dunn-Richmond Economic Development Center so we plan to have a very educational, inspiring and innovative year that continues to build on the name of Southern Illinois University Carbondale,” said Brandon Nolte, a business management major. Labelled with the slogan “Imagine, Innovate, Inspire,” the SIU Innovation Series are designed as hands-on workshops that will provide the students with plenty of competitions, learning experiences, and opportunities to network with other students and professionals which may potentially lead to unique start-up ideas. All events will be held at the Dunn-Richmond Economic Development Center in Carbondale.